Associate Administrator of Operations with Dining Services Michael McCullough has been employed with URI dining for 25 years and has expanded from food production to operations. “Before URI I worked with a couple fmcg companies where our loyalty was to our manager, here it’s to our customers and I feel like because of that we are able to make more things happen in terms of waste reduction and planning,” McCullough said. URI is involved in The National Association of College & University Food Services (NACUFS), a peer organization that sets the standards and ethics for College Food Services and allows all universities participating in the organization to observe how other dining halls handle production and operation. “Through NCAUFS we can see what other dining halls at other schools are doing, and in comparison URI is pretty cutting edge, not just within our region, but nationally,” McCullough said. 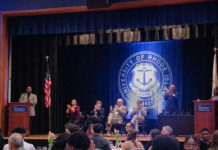 Since renovation both dining halls have become nationally recognized, with Hope Dining Hall receiving a National Award for best concept and design, and the Corner Store downstairs receiving a Best in Business award for the best product mix, among other celebrated awards and nominations. However, the amount of waste the dining halls accumulate is apparent to almost anyone that takes a brief look beyond the conveyor belt of dishes and consumer waste. “We use a windows-based menu managing system called C Board to track our number of customers per week, per day, per meal and even per hour as a reference for how much food to prepare for future scenarios,” McCullough said. URI uses a system of fixed menus with 32 different weeks of menus per dining hall, the different combinations of food may change based on popularity or new products being added, but the system of menus is predetermined to account for product bidding, payment and delivery time. From the warehouse the food is delivered to the dining hall, portioned, thawed and prepared. Determining the amount of food to make for each meal is done in preparation for each day by compiling a reference of previous records. The managers will suggest a ballpark quantity of each food item they think should be prepared and the chefs will work around that number to prepare enough food that they do not run out and not too much that trays are wasted. Briana Vazquez, a junior human development and family studies major worked at Hope for two and a half years for the closing shift on Mondays and Wednesdays, said Hope prepares too much food. “One of the ways we drastically reduce waste is the cook-to-order stations like the stir fry and pasta options,” McCullough said. “The food isn’t prepared until the person orders it, which saves on production and helps to eliminate waste… Some days we do have too much food, which is why we are partnered with the Food Recovery Network, a student based national organization, that takes all of the food that can be redistributed to the local shelters. Shelters like the Galilee Mission and other Rhode Island based food shelters welcome the excess food on a week-to-week basis. Come May there is a large gap between end of the semester and orientation which leaves the warehouse stocked with excess perishable food items. These items are donated to the Rhode Island Food Bank so that they can be distributed to shelters throughout the state. Another organization that accepts donations from the dining halls is the Rhode Island Center Assisting those in Need (RI CAN), McCullough has been a chef in RI CAN’s soup kitchen for 19 years and they take food items that are brought to the dining halls by food brokers that cannot be used for large scale production, but can be used as part of a meal for the soup kitchen. 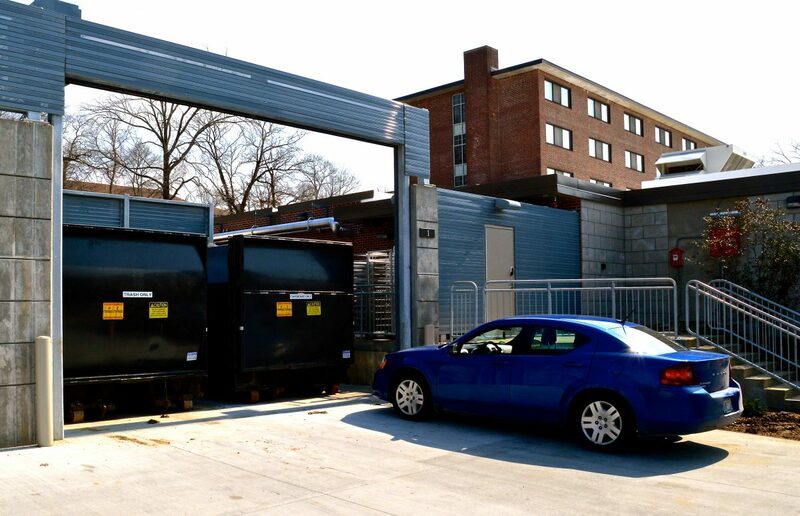 As of right now, the byproduct is disposed of with the other waste, but there is hope for composting in the future if dining services and facilities can contract a vendor that will handle the byproduct in the most environmentally conscious way. In addition to recycling their waste oil to be repurposed as bio fuel, reducing the volume of their consumer waste, donating excess food and products to those in need and only preparing what they think will be consumed, Dining Services also takes other measures to significantly impact the waste of students. By removing trays from the dining halls it has been demonstrated that students take less food and as a result have less waste. Other examples include repurposing leftover, untouched, product for different meals. “If we have big trays of untouched chicken, the next day you might see some barbeque chicken pizza, we like to use the ingredients we have and cut down on waste where we can,” McCullough said.